We were ready. The planning was over and now it was time for National Night Out! The tables were set, the band was finishing their sound check and neighbors were beginning to arrive. Right on time, the fire truck from our local HFD Fire Station 16, pulled up. They said they were going to park in the middle of the street, blocking it. That sounded good to me. Just then they got a phone call ,”We have to make a quick run. We’ll be back!” Off they went, to work. Meanwhile, the band started playing. Allen Oldies Band, all dressed in classic suits and ties playing from a neighbors’ front driveway and serenading folks as they walked down the street. They were great! The dance floor, aka. the driveway, was open and the children started to dance. The dancing wouldn’t end until the music did, well after dark. Neighbors arrived from all over our 12 block neighborhood, adding their appetizer or sweet dish to the table, signing in, slapping on a nametag and grabbing a beverage. The party was off to a festive beginning as everyone began to talk with their friends and neighbors. And, the Fire Truck and firemen returned from Station 16. 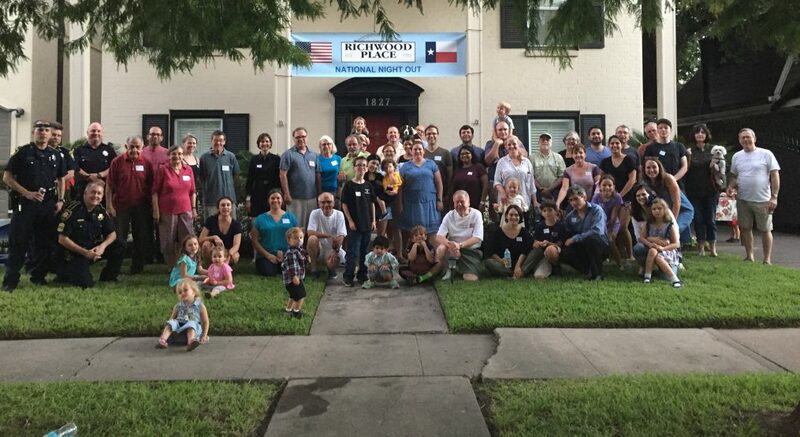 We had well over 125 neighbors in attendance. One of the first to arrive was a gentleman who has lived in Richwood Place for 38 years. He talked about the changes to the neighborhood and said this was his “first neighborhood event!” He had received 2 invitations, so he had decided to come on out for the party. There was the couple who just moved in. They were excited to meet more of their neighbors and get a feel for the neighborhood. Of course, there were the familiar faces, the folks who support and come to every event and then there were the new faces, some young, some older. But, new. Lots of new smiling faces. And, kids! There were children everywhere. They were dancing, sneaking cookies from the food table, playing with giant blow-up hammers, running, walking and being held by their parents. They were happy to see each other. This night was special. It is one that won’t soon be forgotten. And, it wouldn’t have happened without some very special folks that I’d like to take a moment to sincerely thank. First, thank you to our hosts. For offering your part of the block…again! For grilling, helping to set everything up and cleaning up after the party. Thank you for offering a driveway stage and dance floor. And, to our hosts that were busy welcoming our newest resident. We thank you for always supporting our great neighborhood! Welcome to Richwood Place, little one. Second, a huge “thank you” to our sponsors!!! Our neighbor and friend, Ash Rowell and Duff Beer and Wine Distribution provided all of the beer and wine. If you were there, you saw the variety of really great beers he provided for the event. This was awesome! Ash, you and Duff outdid yourself! Thank you! Our invitations and banner would not have happened without two of our sponsors: Moustapha El-Hakam, Attorney at Law and REPRINT!, Your Local Printer. Thank you to Moustapha for designing the invitations, banner and street sign toppers. Our neighborhood printer, REPRINT!, located at the corner of S.Shepherd and 59, south of 59 printed everything for us. Craig Pritchard, at REPRINT!, was amazing to work with. They were fast and did everything right the first time. I thought the invites and banner looked amazing. And a big thank you goes out to two Neighborhood Realtors for sponsoring the event: Cliff Helmcamp with Greenwood King and Jerry Blum with Heritage Texas. These two sponsorships were key to us being able to hire the Allen Oldies Band. And, that was such a huge part of making the night as fabulous as it was. The energy was great and the music was awesome! Thank you to Cliff Helmcamp and to Jerry Blum for your sponsorships of the event. The band rocked! Thank you to all of the neighbors for coming to National Night Out 2011! It was a huge success. Please support our sponsors, as they were a big part of this event being as successful and fun as it was. We will be following up with folks and asking them to join the civic association. Dues go toward events like this one, security, deed restriction enforcement, beautification projects, etc. You can join by clicking the above tab “Join Today!” Annual dues for 2011 are $25 per household, or you are welcome to donate more. Thank you for your support. We hope to see you around Richwood Place! Have you paid your 2010 dues? All residents of Richwood should become members of the Civic Association. The dues are only $25 annually per household. As a member, your dues will support the beauty, security, and historic preservation of the neighborhood. Additionally, members have voting rights at the quarterly association general meetings. Please pay your dues online today — it only takes a minute. You can pay $25 for the year or subscribe to pay annually.